It’s not always simple to describe what we do at Flow, when we respond to a wide variety of contracts and adapt very flexibly to what our clients need. Over the past 11 years we’ve been in roles that include ‘learning partner’, ‘evaluator’, ‘audience researcher’, ‘programme planner’, ‘critical friend’, ‘trainer’ and ‘change facilitator’. Central to all of these roles is our ability to help cultural organisations develop and narrate a Story of Change, and to help them design experiences that power the changes they want to create. Through these many projects, we’ve built up a set of tools for planning and tracking change. A major resource that we’ve developed is the Thrivable Culture toolkit. We’ve called it this because we believe that ‘Cultural’ opportunities help people, places and planet thrive, and that in turn, a thriving world allows rich and diverse ‘cultures’ to grow. By ‘Cultural opportunities’ we mean a very broad set of things – having freedom and resources to learn and enquire, to cherish our shared heritage, to express feelings, be imaginative, make things and innovate for the future. This contributes to wellbeing in the wider ‘culture’ – in all the ways we communicate, celebrate, critique and create as a society. Cultural opportunity is driven by the public Arts and Heritage sectors, but also by the Media and commercial Creative Industries, by Science Engagement, and by the Education and Health sectors. By the term ‘Thrivable’ we are referring to an approach to growth that favours wellbeing for the many over wealth for a few. So, a Thrivable Culture is one where people and places flourish by pursuing what they love, helping each other and looking to the future. This is the big Story of Change that makes Cultural organisations so valuable. We hope that working with us using these tools will enable you to tell and realise your own part of this Story of Change, in ways that are meaningful to you. The underlying philosophy of these models comes from our namesake, the idea of ‘flow’ or optimum engagement, developed by Csikszentmihalyi. This helps us analyse how people are both supported and stimulated by any experience, and what the barriers are to engagement. In order for organisations or their projects to inspire people, overcome challenges, and design for learning and change, we need to pay attention to how people can feel really absorbed, inspired and empowered. This is all about improving the qualities of experiences, places, materials, questions, processes and relationships so that staff, partners and audiences are both supported and challenged. From the zone between too much anxiety and too much boredom, people draw their energy to change. Improving quality in these conditions is just as important as impacts such as measurably increasing income or creating jobs. Or rather, in the Cultural sector, improving quality is the best way to achieve those quantifiable impacts. Logic Models used in processes informed by Theory of Change can help organisations to define and evidence how inputs and outputs of any project result in quantifiable outcomes and longer-term impacts. However, in cultural and experimental projects, or people-centred areas such as education, it can be hard to predict and quantify these outcomes. Rigid application of this model, seeing it as a narrow pipeline of change, can cause anxiety, an inability to pull together around common goals and a sense of inevitable failure. It can also be tricky to start at the end of the line and to think backwards from desired impacts. 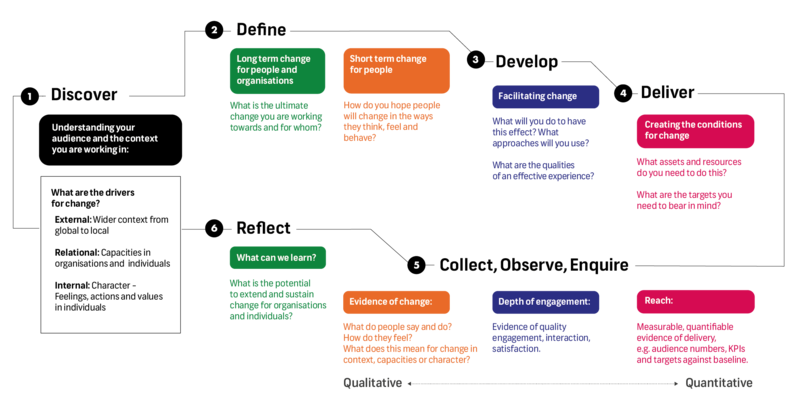 As part of our toolkit, we’ve designed a new version of the Logic Model format to help teams plan for and evaluate change which we believe overcomes these problems. It is more circular, makes much more clear how planning and evaluation activities sit together, and it encourages more pause to think through the early steps of learning about your context and creating conditions for change. The following explains an element of our framework in depth: What you do at the start of Discover phase of a project. An important part of our approach is ‘front-loading’, which means thinking before launching into the hard or expensive parts of any programme or new project, taking time to build relationships, to clarify common values and to research the context around you. This doesn’t have to mean a long vague phase before implementing any project. It means distinguishing between the WHY and the HOW, or the Aims and Objectives. It means ensuring that all stakeholders are agreed on what you want to achieve, holding on to that vision while you test and develop a project, and being prepared for unpredictable contingencies as you go. External factors: How you work in your wider context. How you optimise your use of resources and overcome external challenges. 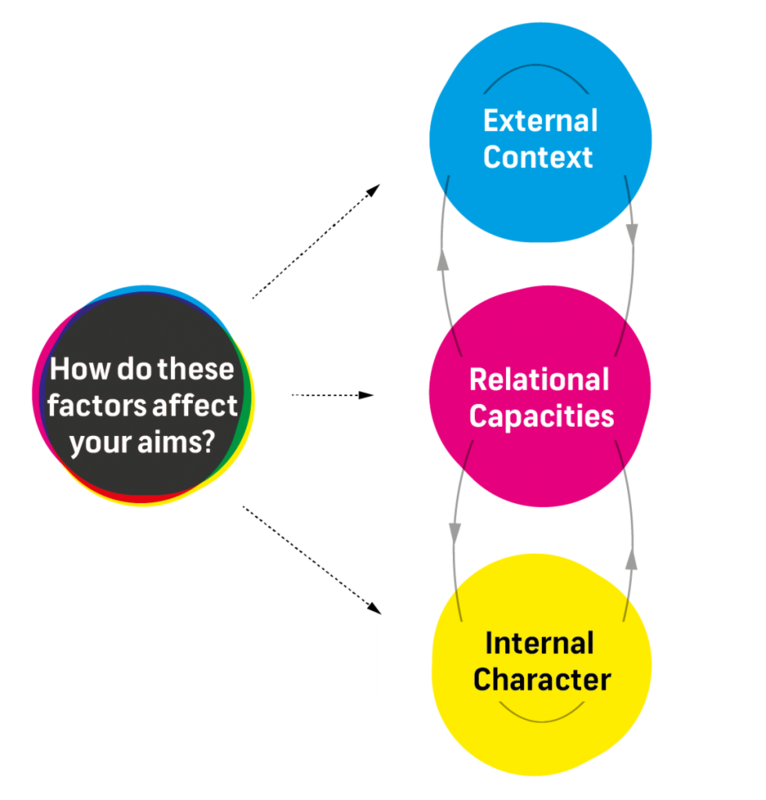 Relational factors: How you design conditions for people to interact with each other. How you help people to develop their capacities for positive change by learning from others. Internal factors: How your experiences or services can inspire shifts in people’s values and character, including your own. (These may not be easily quantifiable in themselves but can potentially create quantifiable change in people’s lives or the wider world). These correspond to the three ecologies, environmental, social and mental, described by Arne Naess. The diagram below shows how the three lenses interact with each other continually, and in both directions. 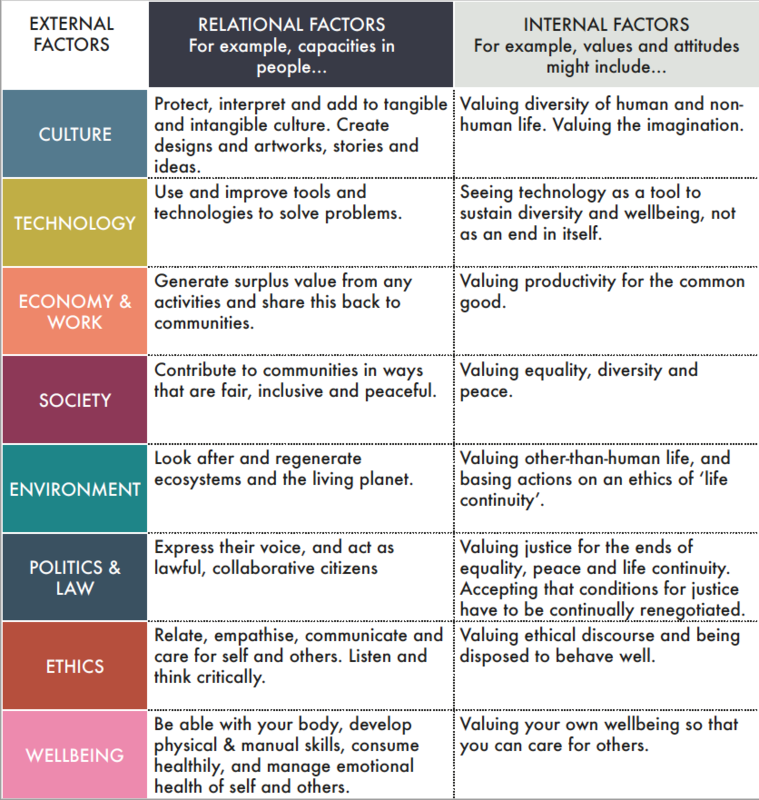 Relational factors are in the middle, as these connect and maximise the potential of the other two, helping individuals and organisations relate to the world around them and other people. Why is it so important to look carefully at your situation? Looking ahead, the wider world is becoming more difficult, and resilience in the face of this is the buzz word. In some countries such as the UK and USA, Culture and Science sectors are struggling to be fully valued due to political change. Some other countries are investing properly in these sectors, but wider environmental or economic conditions might threaten their progress. To be resilient, it’s vital to be hyper aware of external threats and opportunities emerging now and on the horizon. Being hyper-aware does not just mean vigilance. It means thinking about how all these change factors interact in an increasingly complex and unpredictable system. The next diagram shows the tool we use to help organisations analyse their situation, combining the Three Lenses, and with eight external factors presenting the threats and opportunities to achieving desired outcomes. The 8 external factors are used like the PESTEL or STEEPLE analysis frameworks, but we have added the factors of Culture and Wellbeing. This new approach to analysing threats and opportunities is loosely based on Maslow’s ‘Hierarchy of Needs’, but uses an ecosystem instead of a pyramid to illustrate how all the contributing factors work together. 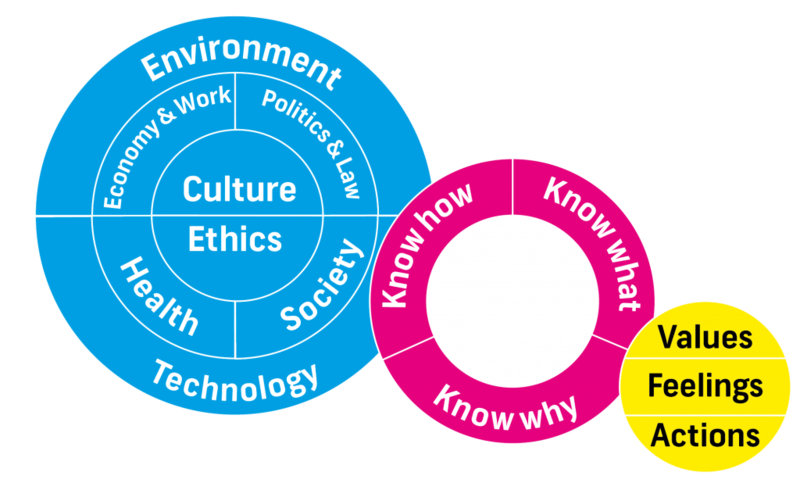 In this ecosystem, Culture and Ethics sit at the centre of the circle, and Relational capacities and Internal values fall out of them and feed them. By identifying the factors that offer the most scope for opportunity you can look for ways to overcome threats in other areas, to recognise where your project can have most impact. For example, the solution to overcoming an External threat – such as a change in Government that reduces funding – might involve working on Internal values or Relational capacities. In turn, the solution to fundamental problems with Relational or Internal factors might lie in leveraging an External factor, such as interventions to improve physical and mental health. Here, we’ve broadly identified the kinds of Relational and Internal factors that might be nurtured if you want to effect positive change on any of the External change factors, overcoming the threats and generating opportunities. These are examples of ways these factors can be articulated rather than intended as a single correct path. Being a Values-based organisation means inviting your communities to explore and debate how values should be expressed and lived. Contact us on hello@flowassociates.com if you’d like to talk about how our work can help you.